(by Julian E. Barnes, The Wall Street Journal) VILSECK, Germany — …When the Army rolls into Poland next month to take positions near the Russian border…the creature comforts will stay behind. No Whoppers. No foot-long Subway sandwiches. No Pizza Hut pies or caramel lattes at the Army’s version of Starbucks, Green Beans. 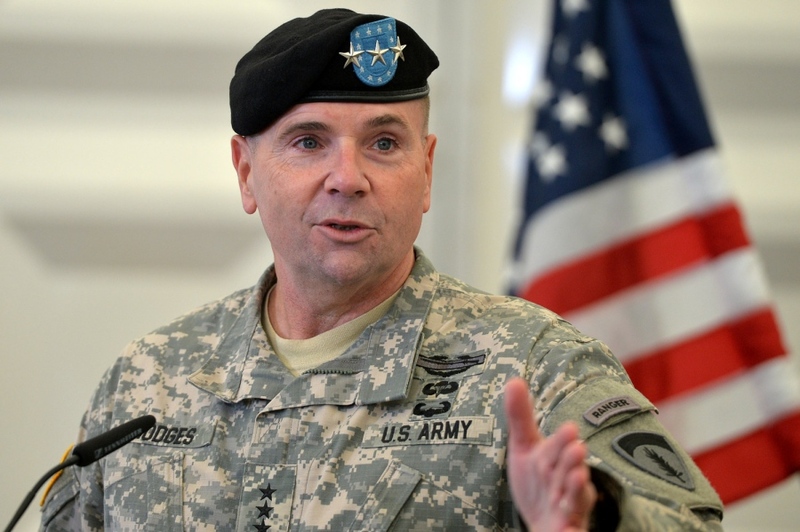 Lt. Gen. Ben Hodges, the top U.S. Army commander in Europe. 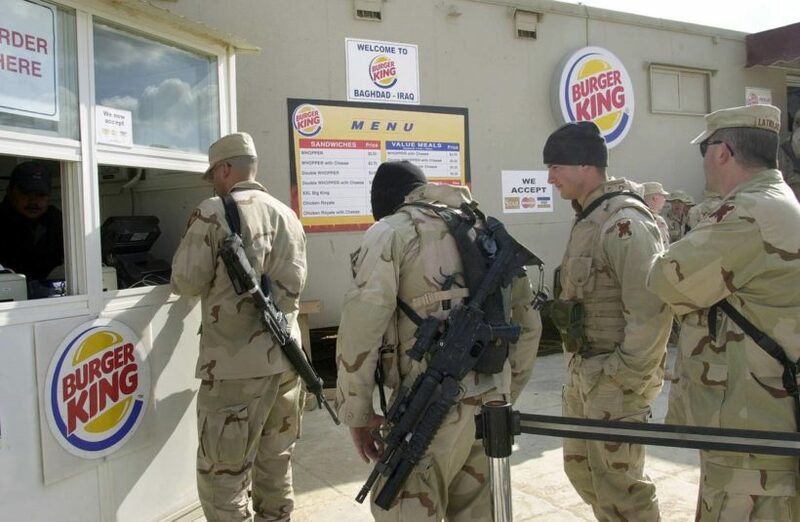 In Iraq and Afghanistan, soldiers stationed at big U.S. bases got used to [having access to] American fast food and shopping at military strip malls. On the menu for Poland: austerity. “The standard of living is Spartan—Spartan, plus Wi-Fi,” Gen. Hodges told the soldiers, to some chuckling. The Army says the internet is necessary for soldiers to keep up with paperwork, to Skype family members and to watch Netflix. Last year, NATO approved a deterrent force in Poland and the Baltic States to counter Russia’s military buildup. After a road march through the Czech Republic and Western Poland, the U.S. Army’s contribution to the NATO force will arrive at its new position early next month. For much of the long wars in Afghanistan and Iraq, the Army fought out of forward operating bases. The military called them FOBs, and soldiers who rarely left those bases were called Fobbits, especially by Marines who often lived in more rugged conditions. In 2010, when Gen. Stanley McChrystal was the top commander in Afghanistan, he ordered the closing of Burger King at bases in that country to put the military more on a war footing. The ban lasted about a year. After Gen. McChrystal was forced to resign after his staff was quoted anonymously speaking derisively about the Obama administration, his replacement, Gen. David Petraeus, decided an Army moves on its stomach. He brought back Burger King. …In Poland, the military will send toiletries and snacks, but no Whoppers, says Command Sgt. Maj. Muhlenbeck. Meals will be taken at a Polish mess hall. Too many amenities, he says, risk creating divisions between those on the front lines and those in bigger bases. Further complicating the culinary dynamic, U.S. troops will be working alongside British, Croatian and Romanian forces and under the supervision of a Polish brigade. 1. How will meal options for U.S. troops deployed to Poland as part of a NATO force differ from options available to them in Iraq and Afghanistan? 2. How did the 2nd Cavalry’s Command Sgt. Maj. Kevin Muhlenbeck explain the decision? Be specific. b) Who is Ben Hodges? – What did he say about the menu for Poland? c) How did Gen. Hodges explain the reason for this decision? 4. Why did Gen. Stanley McChrystal, the top U.S. commander in Afghanistan in 2010, order the closing of Burger King at bases in that country? 5. a) Why are U.S. troops being deployed to Poland? b) Do you think prohibiting fast food outposts from operating during the deployment is a good idea for the reasons stated? Explain your answer. Still, Russia has some of the most adept hackers on the planet. Military officials say they expect Moscow to try to break into any vaguely military network, even if it is used just for streaming movies. They are warning troops to be very careful how they use Wi-Fi. Soldiers can look forward to one other exception to the Spartan barracks conditions in Poland. In Iraq and Afghanistan, the military’s “General Order Number 1” has banned alcohol at U.S. military bases there. European forces generally don’t follow that rule. The French army in Afghanistan had wine in their field rations. The Polish army in Iraq would put on feasts with alcoholic beverages available for visiting general officers. Given the mix of soldiers in the NATO deployment, enforcing an alcohol ban would be a failing enterprise, American officers say.